“I’ve been addicted to sugar since birth,” admits Ari Zion, the pastry chef at highly regarded Cleveland restaurant, Trentina. 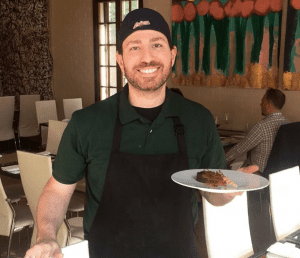 This addiction translates into the passion Ari has for his job, where he has creative control over the dessert menu and often gets the chance to experiment with different delicacies for the tasting menu. Chef Zion creates different variations of gelato and cookies that are served at Trentina for dessert. Although, when you visit Trentina highly recommends trying the butterscotch budino. Even though Ari has always loved dessert, his interest in cooking only started six years ago. When presented with the options of grad school to study psychology or attend culinary school, it wasn’t a hard decision. “Learning to cook seemed like the much more interesting path,” he says. It was then, during an internship at a high-end restaurant in Santa Monica (during the Valentine’s Day rush) that he fell in love with making pastries. Working at Trentina is Ari’s dream job, but his aspirations don’t end there. “For the past 4 years, I’ve had one ultimate goal,” he says. “To own the best donut shop in America.” He plans to open it in Cleveland. Trentina: 1903 Ford Drive, Cleveland, OH 44106, (216) 421-2900.